FRISCO, Texas (Nov. 6, 2018) - Though the 2018 baseball season has ended, the RoughRiders Foundation stayed extremely productive during the month of October. "There's no offseason when it comes to the work we do with the RoughRiders Foundation," said Breon Dennis, Executive Director of the RoughRiders Foundation. 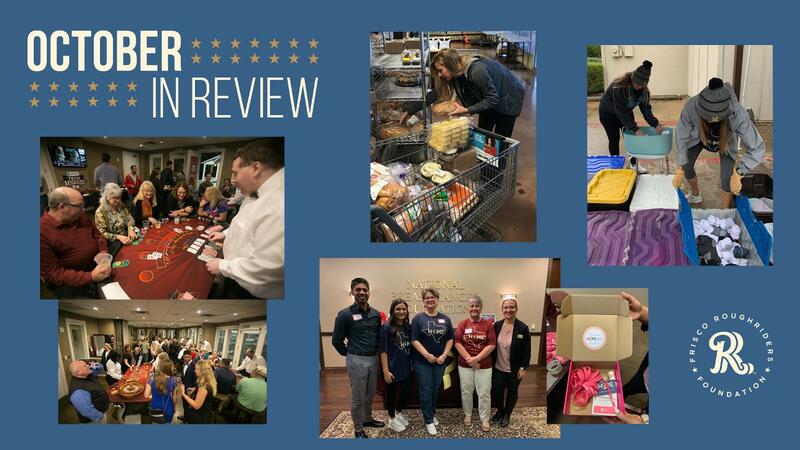 "We are constantly seeking ways to get involved with the great people of North Texas and our body of work in October was no exception." * Casino Night (October 13): The Foundation raised more than $6,000 at its annual VIP event thanks to the generous support of the team's Founder's members, suiteholders and corporate partners. * Frisco Family Services (October 16): Riders staff helped sort through donated items and assisted in restocking shelves at the facility. * StreetSide Showers (October 17): Staff made and distributed hygiene kits, while also helping pass out lunches. * RoughRiders Baseball Academy (October 21): During the latest clinic for kids, Halloween candy was collected and donated to Soldier's Angels Treats for Troops. * National Breast Cancer Foundation (October 24): Riders employees helped make HOPE kits that will be sent out to patients who are battling breast cancer. * RoughRiders Fall Festival (October 27): More than 2,000 cans of food were collected and donated to North Texas Food Bank as part of the team's annual event. * Red River Celebrity Softball Game (October 4), benefitting the Toby Keith Foundation, the Roger Clemens Foundation and the Just Keep Livin Foundation. * The Ticket Dinger Derby (October 26), benefitting Mothers Against Drunk Driving. * Light The Night Walk (October 28), supporting the Leukemia & Lymphoma Society. If you would like the RoughRiders to volunteer with your organization, please email community@ridersbaseball.com. For more information on the RoughRiders Foundation, click here. The 2019 season begins April 4 at Dr Pepper Ballpark. Ticket memberships and group hospitality packages are now on sale. The promotional calendar will be unveiled in early 2019 with single-game tickets going on sale soon after. For more information, visit RidersBaseball.com or call (972) 731-9200. The Frisco RoughRiders are the Double-A affiliate of the Texas Rangers and play their games at beautiful Dr Pepper Ballpark in Frisco, Texas. The team was founded in 2003 and has finished first among all Double-A franchises in attendance in each of the last 14 seasons (2005-2018). In August 2014, the RoughRiders were purchased by an ownership group led by Chuck Greenberg. Since then, the new ownership group, together with the City of Frisco, has spearheaded numerous major franchise enhancements, investing over $8 million in a wide array of facility upgrades and improvements, including a state-of-the-art HD video board, sound system, Bull Moose Saloon, InTouch Grille, Riders Outpost Team Store and the world's largest water feature in a sports facility, the massive Choctaw Lazy River. These enhancements earned the Riders and the City of Frisco Ballpark Digest's prestigious "Best Ballpark Renovation" award for two consecutive years (2015 and 2016). More than 140 former RoughRiders players have gone on to play Major League Baseball, including All-Stars Chris Davis, Adrian Gonzalez, Ian Kinsler and Neftali Feliz, as well as current Rangers stars Elvis Andrus, Rougned Odor and Nomar Mazara. For more information on the Frisco RoughRiders and Dr Pepper Ballpark, please visit RidersBaseball.com or contact Ryan Rouillard at RRouillard@RidersBaseball.com.